Since they led the market in pioneering adjustable trees, Bates Australia have been largely responsible for revolutionising the saddlery trade, shifting the focus from the craft of making a saddle to the performance of the saddle for both horse and rider. Bates Australia introduced the first saddle tree to possess true lateral flexion. The Elasitflex® tree enabled the seat to laterally flex independently from the tree points and in synergy with the horse’s muscular movement during every stride. A changeable gullet system was introduced, whereby a saddler could customise the saddle fit through interchanging three different tree widths (Narrow, Medium and Wide) by fitting the corresponding spring steel gullet plate. The EASY-CHANGE® Gullet System was launched, making it possible for riders themselves to be able to open their saddle and make adjustments to the width of the tree. The range of interchangeable gullet plates was also expanded to include six widths from Narrow through to Extra-Wide. With the addition of a WIDE system the full range now covers 10 widths. Five years on, it was widely accepted that horses do change shape with maturity, level of fitness and diet. As riders are increasingly more educated on the importance of their saddle fit and the need to manage their horse’s backs, they have become more discerning on what they rightly demand from their saddle. The EASY-CHANGE® Gullet System is now one of the most recognised equestrian brands in the world today. Bates Australia launched the CAIR® Cushion System, a truly high performance dynamic saddle panel that ensures even weight distribution and contact over the full bearing surface of the saddle. For the horse, this virtually eliminates pressure points and greatly increases their comfort and freedom of movement. 10 years on, this is now regarded as one of the most significant innovations in saddle design and has proven to be a success worldwide. The award winning CAIR® Panel Insert System was launched to retailers and saddle fitters around the world. Together with the tree adjustability of the EASY-CHANGE® Gullet System, this delivered a whole new level of adjustability in saddles. 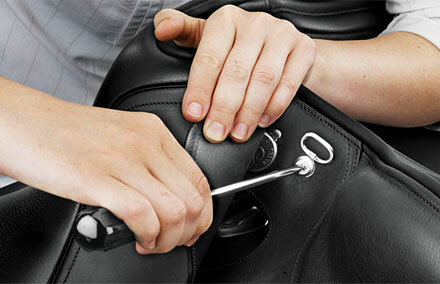 The insert system enabled retailers and saddle fitters to make adjustments within the panel effectively, efficiently and to the highest professional standards. The inserts gave tremendous scope of adjustment within the front, centre or rear of the panel in measured increments of 4mm. The result was a system that was measurable, symmetrical and completely reversible that could be completed on the spot with the rider, so that the fitter could be confident an optimal fit has been achieved. Bates Australia has now developed a means of offering these saddle fitting systems in both saddles featuring high performance CAIR® panels, as well as traditional flocked panels. Other than a few exceptions within the ranges, the vast majority of Bates and Wintec Saddles will now feature these saddle-fitting systems as standard. The EASY-CHANGE® Fit Solution is the first total saddle fitting solution and will revolutionise saddle fitting, setting a new standard adjustability and a new era in what riders demand from their tack. Global patents and design registrations apply.